Today at the 3rd eSports BAR Cannes, Renault announced that it will join the world of eSports in a tie-up with Europe's best-performing French team, Team Vitality, which boasts many international titles. This association with Team Vitality sees Renault forge new ways to engage with an all-new audience including passionate eSports fans and players who share a love of sport, competition and innovation. The partnership creates an all-new entity dedicated to motorsport-based games, known as Renault Sport Team Vitality. 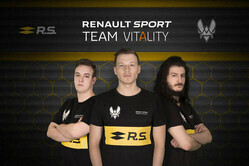 Renault Sport Team Vitality, which will be spearheaded by Philip Paschmeyer - Paschy90 (Rocket League), Victor Locquet - Fairy Peak! (Rocket League) and Sandro Holzwarth - FreaKii (Rocket League), will participate in this year's Rocket League Championship Series Europe, which features car-based sports action and boasts more than 25 million players. Renault Sport Team Vitality is also in discussion with F1 to compete in the Formula 1 eSports Series, a competition based on the ultimate racing simulation game. Renault Sport Racing will provide the team's players with access to its F1 factory in Enstone, to train with drivers and technical staff. Team members will also have an opportunity to meet experts who are accustomed to working in the demanding environment of the F1 paddock. In exchange, Vitality will bring to the table its expertise as a multiple European and World champion in a variety of categories, to assist the new squad's professional players on an everyday basis. In entering eSports, Renault joins major brands like Adidas, Omen by HP, Volvic and Canal+ as an official partner of Team Vitality, with branding visible on players' team clothing at League of Legend and FIFA tournaments. "This partnership is a tremendous opportunity for the Renault brand to be exposed to new and younger audiences," says Bastien Schupp, Vice-President Global Brand Strategy and Marketing Communications, Groupe Renault. "The combination of Vitality's eSports vision and expertise with our successful history in motorsport is a great partnership. As a discipline, eSports have a promising, far-reaching future and we're looking forward to connecting people from Renault Sport Racing to these young gamers and being a part of it." "Vitality's DNA is to be seen as a French front-runner that is competitive in the international arena," added Fabien Devide, aka Neo, Team Vitality's founder and chairman. "Our partnership with Renault is a natural match, not only because we share the same values and colours but also because we all want to make it to the very top of the European and international scenes. At Vitality, we stand to learn a great deal from Renault Sport Racing and how it prepares for Formula 1 races. At the end of the day, many of its methods are the same as those we employ in eSports, namely data and performance tracking, physiotherapy, fitness training and mental training." "The ties that exist between motorsport and gaming are obvious. Both call for mental strength and physical fitness in a highly competitive environment," said Cyril Abiteboul. "Last year's exciting launch by FOM of the Formula 1 eSports Series has accelerated the convergence of these two worlds and created opportunities for collaboration. "Our drivers, and especially those who form part of the Renault Sport Academy programme, and Vitality's own champions will be able to trade best practices. In this area, as in F1, our objective is to build a team for the long term that is both respected and feared by its opponents!" McLaren to announce Dell deal? "Next person the mention "eSports" gets my Son's xbox thrown at them. It's not sport - it's kids playing console games and no I wont be watching it, certainly not paying for the privilege either. What a wonkey world we have let them create........"